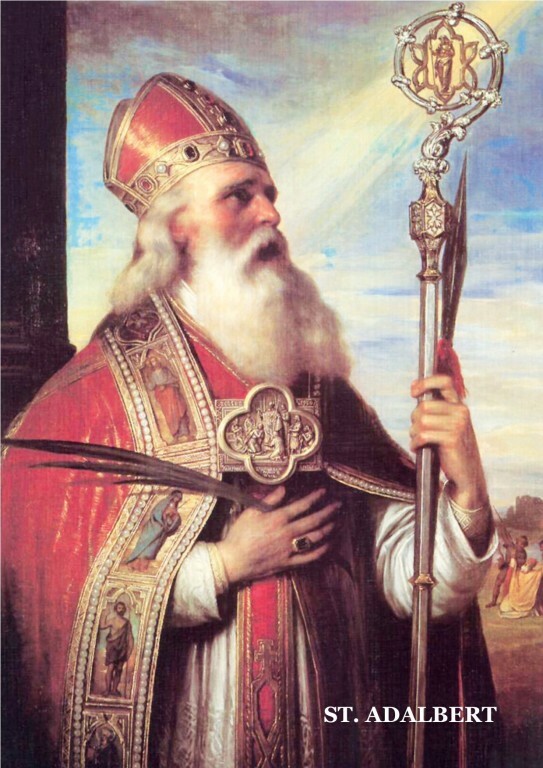 Originally given the name of Wojciech, the boy who would be known as St. Adalbert was born to a family of nobility in the Central European region of Bohemia during the mid-900s. When Wojciech became seriously ill during his childhood, his parents resolved that they would offer their son to God as a priest if their prayers for his survival were granted. Wojciech survived the illness, and his parents sent him to study with Archbishop Adalbert of Magdeburg, a Benedictine missionary who would later be canonized in his own right. The archbishop gave the young student his own name at confirmation, setting an example that the boy would follow in his own life as a bishop, missionary and monk. The young Adalbert was 25 when his mentor died in 981. He returned to his native Bohemia, where Bishop Deitmar of Prague ordained him a priest two years later. However, the end of Bishop Deitmar’s life provided the young priest with a cautionary example that would remain with him until the end of his life. During his last illness, the bishop became terrified of his impending judgment, confessing that he had neglected his spiritual duties in favor of wealth, honors and pleasure. After watching his bishop die on the verge of despair, Adalbert immediately resolved to live his own life in a more penitential spirit than before. He began wearing a hair-shirt and distributing his money to the poor. Soon, he would be chosen to replace the bishop whose agonizing death had shown him the gravity of spiritual leadership. The bishop took steps to reform the finances of his diocese, ensuring that his own expenses made up only a small portion of the budget. Meanwhile, he slept on the floor, fasted regularly, gave sermons almost daily, and visited poor neighborhoods and prisons. But in six years of constant prayer, fasting, and preaching, Bishop Adalbert made little headway among the Bohemians. The low point came when he unsuccessfully attempted to shield a woman convicted of adultery from a mob that sought to kill her. He responded by excommunicating the murderers, but the public seemed to favor them rather than the bishop. Frustrated and dejected, Adalbert journeyed to Rome and asked Pope John XV for permission to retire from his diocese in 989. He joined a Roman monastery and purposely took on its most undesirable tasks of work and maintenance. Five years after Adalbert’s departure, the Archbishop of Mentz – who had consecrated him as a bishop – asked the Pope to send him back to the diocese of Prague. Pope John did so, but made it clear that Adalbert was free to leave if the residents of his diocese continued to resist him. When their former bishop returned, the residents of Prague welcomed him warmly and promised to change their ways. Sadly, however, this promise proved false, and Adalbert came to fear that he might be driven to despair by the rebellious locals. In keeping with the Pope’s provision, he left and became a missionary to the Hungarians. In the course of his Hungarian missions, Adalbert taught – among many others – King Stephen I, who would later be canonized as St. Stephen of Hungary. Afterward, he returned to the Roman monastery of St. Boniface, where he served in the office of prior. But Adalbert’s consecrator remained insistent that he should return to Prague yet again. Pope Gregory V finally ordered Adalbert to resume his duties as the Bishop of Prague. This time, however, the citizens defied him openly. A Bohemian prince named Boleslaus went so far as to kill several of Adalbert's relatives and burn their homes, to make it clear how unwelcome his presence would be. Nonetheless, Adalbert attempted to obey the Pope’s charge, and sent a message asking whether the other residents of Prague might allow him to return. The response he received indicated he should not come back, and would be in danger if he chose to do so. Rejected by his own people, Adalbert decided to begin a mission to the pagan tribes in Poland and northeastern Germany. He successfully converted many of them, but eventually encountered the same hostility that had driven him from his diocese. This was partly because he denounced the native practices of tree-worship and human sacrifice, but also because he was suspected of being a Polish spy. A pagan priest eventually captured Adalbert and his two companions, binding them and taking them hostage while they slept. Adalbert prayed aloud, offering his own life to God and begging forgiveness for his attackers. “You had it always in your mouth that it was your desire to die for Christ,” he heard the pagan priest say, as he stabbed Adalbert in the chest with a lance. Six others proceeded to stab him, and he died of his wounds on April 23, 997. A Polish prince ransomed back St. Adalbert's body from the pagans, exchanging his remains for their weight in gold. His relics were transferred to the Polish city of Gniezno, and kept in the church known as Cathedral Basilica of the Assumption of the Blessed Virgin Mary and St. Adalbert.